On Saturday, May 5, at Crandall University’s convocation ceremony for the 2017-2018 academic year, around 150 students were presented with degrees, certificates, and awards. 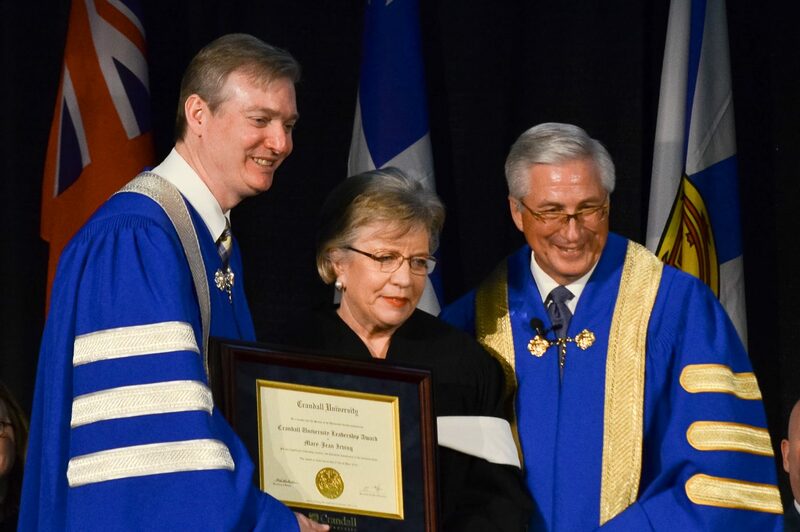 Hundreds gathered at The Court (Crandall’s Gymnasium) – friends, family, political representatives, and the Lieutenant Governor were in attendance to witness the ceremony, with more watching the live stream online. The order of the day also included the presentation of the Crandall University Leadership Award, an annual tradition dating back to 1987. The Leadership Award honours those who model exemplary Christian commitment and leadership within various sectors of the community. For 2018, the award was presented to Ms. Mary-Jean Irving. Mary-Jean Irving is President and CEO of Master Packaging Inc., a state-of-the-art manufacturer of folding carton and corrugated boxes, and Indian River Farms Ltd., a diversified agricultural business. Raised in Saint John, New Brunswick, Mary-Jean is the daughter of James and Jean Irving. A graduate of York University in Toronto, Mary-Jean started her first business on Prince Edward Island in agriculture. Today Indian River Farms Ltd. utilizes leading agronomic practices and technologies to produce high-quality raw potatoes. In 1996, Mary-Jean started her second business with the construction of a corrugate sheet plant in Borden–Carlton, Prince Edward Island. In 1998, she expanded to her second facility in Dieppe, New Brunswick. Most recently, Master Packaging Inc. completed a further expansion in Dieppe. Today, Master Packaging Inc. is the only folding carton plant and the largest corrugate business in Atlantic Canada. Master Packaging Inc. has also received a number of industry awards for their printing technology. In 2007, Mary-Jean was inducted into the Prince Edward Island Business Hall of Fame and, in 2016, into the New Brunswick Business Hall of Fame. 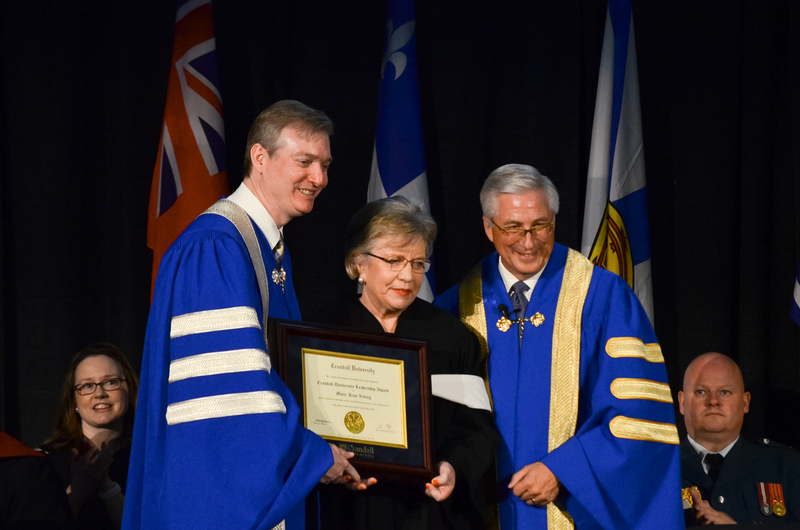 She is also a past member of the Board of Governors for the University of Prince Edward Island. At the core of Mary-Jean’s life purpose and pursuits lies a deep and abiding Christian faith that is central to her business. She is also an ardent supporter of numerous local, national and international charitable causes and missions. Mary-Jean is a breast cancer survivor, and is dedicated to the prevention, detection, and eradication of the disease. Mary-Jean credits her two daughters, Rebecca and Elizabeth, and granddaughter, Genevieve, as tremendous sources of pride, inspiration, and joy in her life. Following the presentation of the Award, Ms. Irving provided an address to the gathered congregation. In it, she urged the graduates to follow the “Three C’s” of building character: courage, conviction, and Christ-centredness. Ms. Irving described these three as interconnected, using the image of a triangle – if any one side is lost, the whole thing collapses. Courage is required to stick to one’s convictions, but both require a Christ-centred foundation. Crandall University is Eastern Canada’s leading liberal arts university devoted to the Christian faith. Crandall offers undergraduate degrees in Arts, Science, Business Administration, Education, and Technical Education as well as graduate degrees in Organizational Management and Education. Founded in 1949, Crandall University is provincially chartered to grant degrees and certificates, and is located on a beautiful 200-acre campus at 333 Gorge Road in Moncton, New Brunswick, Canada.